My Name Is Khan is a 2010 bollywood drama film,directer Karan Johar, producer Hiroo Johar and Gauri Khan, and starring Shah Rukh Khan and Kajol in main roles. The film was jointly produced by Dharma Productions & Red Chillies Entertainment and was distributed by FOX Star Entertainment, which had bought the rights for the film for a sum of 100 crore (US$16 million), making it the most expensive indian film of 2010. 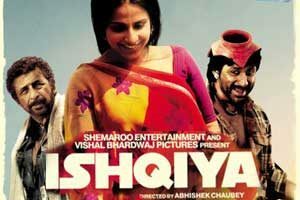 Ishqiya is a 2010 bollywood black comedy film starring Naseeruddin Shah, Vidya Balan, Arshad Warsi and Salman Shahid in the main roles.directer was Abhishek Chaubey in his directorial debut and was producer Raman Maroo and Vishal Bhardwaj. The film was released on 29 January 2010. The film performed well at the box office. It was selected for screening at the 34th Cairo International Film Festival. A sequel Dedh Ishqiya was released in January 2014 with the same cast and crew, sans Vidya Balan, who was substituter Madhuri Dixit and Huma Qureshi. Veer An Epic Love Story of a Warrior in a 2010 bollywood action drama film directer is Anil Sharma, and staring Mithun Chakraborty, Jackie Shroff, Salman Khan, Sohail Khan, Zarine Khan. Pyaar Impossible! is a 2010 indian romantic comedy film director is actor-turned-director Jugal Hansraj under the banner of Yash Raj Films. It starring Priyanka Chopra & Uday Chopra in the main roles. The film starring Anupam Kher and Dino Morea in supporting roles. It is remake of 1991 soth film Kilukkampetti. Pyaar Impossible! was released on 8 January 2010. Dulha Mil Gaya is a 2010 Indian romantic comedy film directer is Mudassar Aziz. It starring Sushmita Sen, Ishita Sharma & Fardeen Khan in the main roles whilst Shahrukh Khan makes an special appearance. Film released on 8 January 2010 and was one of the first Bollywood releases of 2010 . Dulha Mil Gaya was panned by critics and did poorly at the box office, earning back roughly half its budget. Bajirao Mastani is a 2015 Indian Hindi language epic historical romance film directer Sanjay Leela Bhansali, who also composed its soundtrack. The film was jointly producer Bhansali and Eros International’s Kishore Lulla; it starring Ranveer Singh as Bajirao I and Deepika Padukone as Mastani, with Priyanka Chopra playing Bajirao’s first wife Kashibai.